How to Activate Edraw MindMaster? Activate Edraw MindMaster and make it pro version. 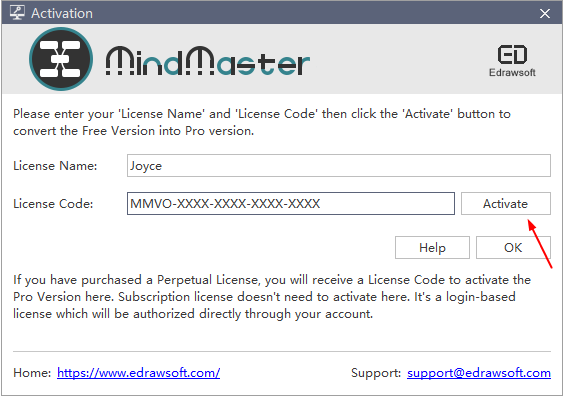 After you purchased a license key, you can activate your Edraw MindMaster and make it pro version. Below are activation steps. 1. Go to the Help tab, and click the Activate button. 2. Enter a license name and your license code, then click Activate. Download Edraw MindMaster and Start Mind Mapping Now! Edraw MindMaster offers you a simple way to create mind maps on Windows, Mac, and Linux. Download it to enjoy its abundant themes and templates, powerful toolkit, and awesome ways to present and share. Try it Now!